Partly cloudy. Low near 55F. Winds SSE at 5 to 10 mph.. Partly cloudy. Low near 55F. Winds SSE at 5 to 10 mph. Arizona’s Dominique McBryde, left, and Sam Thomas grab handfuls of confetti from the McKale Center floor as the team celebrates their 56-42 win against Northwestern in WNIT championship. 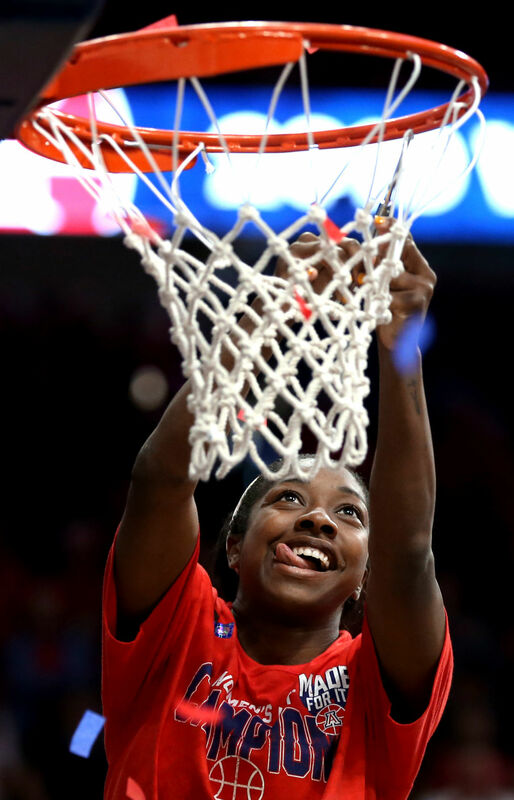 Aari McDonald proved her worth as one of the best players in the country while scoring 890 points — most ever in a season by a UA basketball player, male or female. For the first time in program history, the UA women’s basketball team played a game in the month of April. The team’s April 6 win over Northwestern netted Arizona its second WNIT championship and put a cap on the biggest turnaround in program history. The Wildcats finished 24-13 — an 18-win improvement from the 2017-18 season. Most expected an improvement from coach Adia Barnes’ team. But like that? Arizona had the right mix: A No. 5-ranked recruiting class led by UA’s first-ever McDonald’s All-American, Cate Reese. A top transfer class with three players — Aari McDonald, Dominique McBryde and Tee Tee Starks — boasting major college experience. And returnees — point guard Lucia Alonso, do-everything forward Sam Thomas and two seniors, Destiny Graham and Lindsey Malecha. Arizona had an 11-game winning streak early in the year, beat two ranked teams — ASU and Cal — and nearly upset Stanford and Oregon State, two teams that went deep in the NCAA Tournament. 1. Aari McDonald is one of the best players in the country. The speedy guard scored 39 points in the Wildcats’ second game of the season, and would score 30 points or more eight times all season. McDonald did more than just score. She snaked her way through defenders, came up with steals and deflections and jumped higher than anyone else on the court for rebounds. McDonald won Pac-12 player of the week honors three times, was named to the All-Pac-12 Team and All-Pac-12 Defensive Team, and was named honorable mention All-American by The Associated Press and WBCA. Oh, and she became Arizona’s single-season scoring leader, male or female. McDonald scored 890 points, a 24.1 points-per-game average that ranked third nationally. The fourth player in Pac-12 history to score 800 points in one season, joining UW’s Kelsey Plum, and Stanford’s Chiney Ogwumike and Nnemkadi Ogwumike. The first player since 2000 to score 800 points, grab 200 rebounds, dish 150 assists and register 90 steals in one season. One of two players since 2000, along with UConn’s Maya Moore, to score 800 points, grab 200 rebounds and dish 150 assists in one season. That’s as dominant as it gets. No one — not even her coach — knew McDonald would have that type of season. 2. The Cats play better when they’re confident. All season, Barnes said her team needed to learn how to win. It took a while, but the Wildcats did just that. The UA lost three overtime games — to UCLA, Cal and Oregon State. Stanford needed a 3-pointer with 29 seconds left in regulation to beat the UA in Palo Alto, California. The Wildcats turned the corner late in the season, winning seven of their final eight games. The average margin of victory: 14.9 points. 3. Cate Reese is a force inside. Reese posted a double-double (21 points, 10 rebounds) in her first college game. The forward then became the first Arizona player to win Pac-12 freshman of the week honors, and she did it three times. Reese finished the season leading all freshmen in scoring (11.8 points per game) and rebounds (6.7 per game). The Texan improved as the season wore on. In her first WNIT game, she scored 20 points and grabbed 10 rebounds. She finished the postseason shooting 60% from the field, and shot 94% (16 of 17) from the free-throw line. Reese was named to the WNIT’s all-tournament team. 4. Adia Barnes is on the rise. Barnes hit all the right marks in Year 3. She pivoted at various times during the season when the players weren’t picking things up, and discovered new ways to teach them. When they needed to rest more, she made practices shorter and more intense. The coach found new ways to keep her team motivated. None of this surprised Brian Agler, who coached Barnes on the WNBA’s Minnesota Lynx. The Wildcats hope more postseason appearances will follow. Barnes and her team have their sights set on making the NCAA Tournament next year. Can Arizona fans pack McKale again? Will Aari McDonald improve? PJ Brown takes a deep dive.